Queen Charlotte's and Chelsea Hospital is one of the oldest maternity hospitals in Europe, founded in 1739 in London. Until October 2000, it occupied a site at 339–351 Goldhawk Road, Hammersmith, but is now located between East Acton and White City, adjacent to the Hammersmith Hospital. It is managed by the Imperial College Healthcare NHS Trust. The hospital strictly dates its foundation to 1739 when Sir Richard Manningham founded a hospital of lying-in beds in a 17-room house in Jermyn Street. ("Lying-in" is an archaic term for childbirth, in reference to the period of bedrest expected of mothers in their postpartum confinement.) This was called the General Lying-in Hospital, and was the first of its kind in Britain. In 1752 the hospital relocated from Jermyn Street to St Marylebone and first became a teaching institution. [a] On 10 January 1782 a licence was granted to the hospital charity by the Justices of the County of Middlesex (at that time a legal requirement for a maternity hospital). In 1809 the Duke of Sussex persuaded his mother, Queen Charlotte, the wife of King George III, to become patron of the hospital: it became, at that time, the Queen's Lying-in Hospital. The queen held a ball every year to raise funds for the hospital. It moved to the Old Manor House at Lisson Green in Marylebone in 1813 where it was completely rebuilt to a design by Charles Hawkins in 1856. Queen Victoria granted a Royal Charter to the hospital in 1885. It was renamed Queen Charlotte's Maternity Hospital in 1923. Maternal death was a common occurrence; one cause, postpartum infection (then known as childbed fever, and now also as puerperal sepsis), was referred to as the doctor's plague, because it was more common in hospitals than in home births. Once the method of spread was understood, an isolation block was opened in 1931 in Goldhawk Road. The rest of the maternity hospital moved to Goldhawk Road to co-locate with the isolation block in 1940. In 1948, on the creation of the National Health Service, the hospital linked up with the Chelsea Hospital for Women to form a combined teaching school. The Chelsea Hospital for Women moved from Fulham Road to share the site under the new title Queen Charlotte's & Chelsea Hospital in 1988. In 2000 the hospital moved to Du Cane Road, next to the Hammersmith Hospital. The main entrance of the hospital. The hospital has a specialist "maternal medicine" unit for London, recognising that a need existed for specialist care to be offered to pregnant women who suffered from pre-existing medical conditions, or conditions that developed during pregnancy, whose treatment might impact upon the pregnancy. The unit is known as the de Swiet Obstetric Medicine Centre, and is currently housed in a small suite of rooms on the second floor of the Queen Charlotte's and Chelsea Hospital. 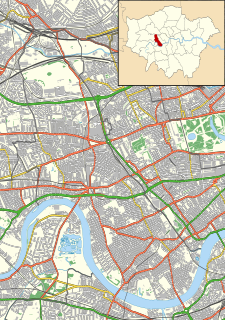 The hospital is accessible by public transport; the nearest bus stops are "Wulfstan Street" and "Hammersmith Hospital"; the nearest tube station is East Acton (Central Line). ^ The hospital appears to have arisen out of the 1739 foundation, but with varying degrees of recognition, developing over time. The inter-relation of these different dates, and the complex supporting evidence for each of them, is fully discussed and documented in the first chapter of "The History of Queen Charlotte's Lying-in Hospital", a large volume published in 1885, and written by Thomas Ryan who was then Secretary to the hospital trustees. ^ "Queen Charlotte's and Chelsea Hospital Address". ^ Google Earth imagery shows the site being demolished in September 2000. ^ "Queen Charlotte's and Chelsea Hospital". AIM25. Retrieved 13 May 2018. ^ "History". Imperial College Healthcare NHS Trust. Retrieved 13 May 2018. ^ a b c d e f "Queen Charlotte's Maternity Hospital". Lost hospitals of London. Retrieved 13 May 2018. ^ Maternal medcine Archived 3 September 2014 at the Wayback Machine. ^ "Queen Charlotte's and Chelsea Hospital". Imperial College Healthcare NHS Trust. Retrieved 13 May 2018. ^ "Hellomagazine.com". Hellomagazine.com. 24 January 1986. Retrieved 15 June 2013. ^ Culbertson, Alix (5 November 2014). "Kensington heartthrob Benedict Cumberbatch gets engaged to Hammersmith girlfriend". Ealing Gazette. Trinity Mirror. Retrieved 27 March 2017. ^ "Zak Starkey". Truth About the Beatles' Girls. Retrieved 13 May 2018. ^ "FreeBMD Entry Info". www.freebmd.org.uk. Retrieved 4 April 2016. Ryan, Thomas (1885). The History of Queen Charlotte's Lying-in Hospital from its foundation in 1752 to the present time, with an account of its objects and present state. Hutchings & Crowsley.